As 1912 drew to a close, Europe seemed to be teetering on the brink of war. The victory of the Balkan League over the Ottoman Empire in the First Balkan War put Serbia on a collision course with Austria-Hungary over the issue of Serbian access to the sea through (formerly Ottoman) Albania, including the important port of Durazzo (Durrës). Fearing Serbia’s influence on Austria-Hungary’s restive Slavs, Austro-Hungarian foreign minister Count Berchtold was determined to prevent Serbia from becoming a maritime state by creating an independent Albania—and was apparently willing to resort to military means to achieve this goal. On November 28, Albania declared independence with support from Austria-Hungary, but most of the country was still occupied by Serbian, Greek, and Montenegrin forces; the Serbians captured Durazzo and Serbian and Montenegrin armies continued to besiege the important city of Scutari, which Berchtold also wanted to give to Albania. On December 3, the Greek navy bombarded Vlorë, where the Albanian provisional government was meeting—not exactly an indication the Balkan League was prepared to recognize Albanian statehood. On December 7, 1912, Austria-Hungary ratcheted up the tension again by mobilizing two more army corps even closer to Serbia: the XVI corps, based in Sarajevo, and the XV corps, based in Ragusa (Dubrovnik). At Berchtold’s request, Emperor Franz Josef also called up the Landswehr, or local militia, in Dalmatia on the Adriatic coast. 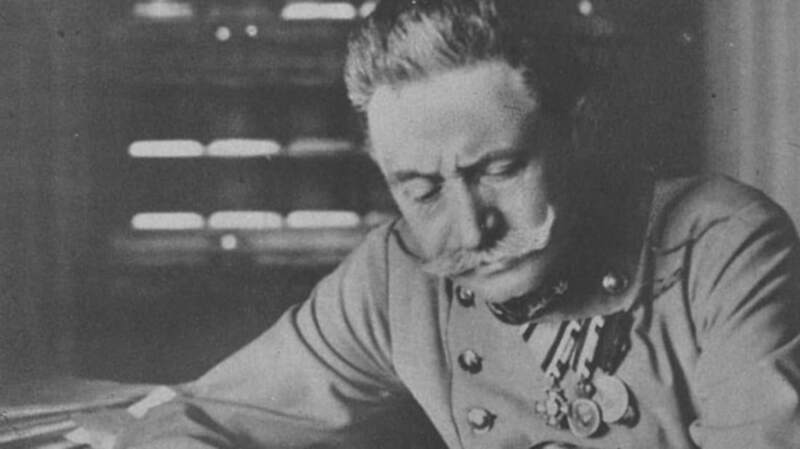 Perhaps most significant, on December 7 Franz Josef reappointed the energetic, bellicose General Count Franz Conrad von Hötzendorf to his old post of chief of the general staff, where he exerted a powerful (and technically unconstitutional) influence on Austro-Hungarian foreign policy. On December 14, 1912, Conrad advised Archduke Franz Ferdinand, the heir to the throne (who, as Conrad’s political patron, was responsible for his appointment on December 7) that in the face of rising Slavic nationalism, Austria-Hungary’s only chance of survival was to simply absorb Serbia—by force if necessary. In the long term, Franz Ferdinand and Conrad essentially hoped to do an end run around Slavic nationalism by restructuring the Austro-Hungarian Empire as a tripartite state with the addition of a third monarchy representing the Slavs—an idea known as “trialism.” In the most likely scenario, Serbia might join the empire but retain its own monarchy, like the Kingdom of Bavaria in the German Empire. Unsurprisingly, this idea was bitterly opposed by Serbian nationalists and pan-Slav ideologists in the Balkans and Russia, who prized independence as an integral part of the Slavic national project. “Trialism” was also absolutely opposed by the Hungarians, who feared it would diminish the power they secured in the dual monarchy agreement of 1867 by absorbing more Slavic subjects (making Franz Ferdinand a dangerous enemy to both Slavic nationalists and Hungarian aristocrats). Now, in the face of yet another Serbian affront (access to the sea), Austria-Hungary was apparently taking a hard line. Typically, Conrad was prepared to go all the way: On January 9, he advised foreign minister Berchtold to attack Serbia as soon as possible, and “Russia must be overthrown.” But Franz Ferdinand opposed going to war over Albania, “that poverty stricken grazing ground for goats." Like Conrad, the heir to the throne felt the real long-term threat to Austria-Hungary was Italy, a Great Power with nationalist claims on Austrian territory (even though it was supposed to be Austria-Hungary’s ally under the Triple Alliance). On the other side, was it really worth it for Russia to call Austria-Hungary’s bluff and risk a European war, all over the issue of Serbian access to the sea? To keep the situation from spiraling out of control, diplomats from all Europe’s Great Powers hurried to arrange a meeting where they could settle the situation in the Balkans. The Conference of London (actually two parallel conferences—one between the Great Powers, one between the Balkan League and the Ottoman Empire) was set to convene on December 17, 1912. While some European powers were working to defuse the situation, others seemed to be looking for a fight. Germany was in a particularly belligerent mood—not because German interests were really affected by the issue of Serbian access to the sea (they weren’t), but out of concern for the prestige and influence of their ailing ally Austria-Hungary, both in the Balkans and Europe in general. Between their anxiety about Austria-Hungary’s position and paranoia about “encirclement” by Britain, France, and Russia, the German leadership was not in a mood to compromise or heed warnings. On December 8, 1912, the Kaiser convened what came to be known as the “Imperial War Council” to consider the possibility of a European war and assess Germany’s chances. Attendees at the War Council included Wilhelm II, chief of the German general staff Helmuth von Moltke, and Admiral von Tirpitz, the architect of German naval strategy, as well as two other top admirals. Tellingly, Germany’s top civilian leaders weren’t even invited: Chancellor Bethmann Hollweg and foreign secretary Kiderlen-Wächter only found out about the meeting a week later. In keeping with the racialist thinking of the day, Wilhelm and most of his peers viewed the confrontation between Austria-Hungary and Serbia as the harbinger of an impending “racial struggle” between the Germanic and Slavic peoples, as he warned German Jewish shipping magnate Albert Ballin, director of the giant Hamburg America Line, in a personal letter on December 15, 1912. In 1912, Berchtold chose to settle the matter diplomatically, but through this racial lens, the situation in the Balkans was grim and inexorable; to the German and Austro-Hungarian elites, some kind of confrontation was inevitable. In the end, on December 8, 1912, Wilhelm sided with Tirpitz, who begged for another year and a half, promising the German fleet would be ready for war in 1914. In the meantime, all agreed, Germany had to focus on ramping up its own armaments program, strengthening its alliance with Vienna, and seeking potential allies among Europe’s “undecided” states, including Bulgaria, Romania, and the Ottoman Empire. Everyone hoped that Britain would stay out of the fight (an interesting mental contortion, considering they were meeting in response to a British warning, but entirely typical of Germany’s leadership).